If you’re looking for a fun night out with the ladies, Chick Flick The Musical is for you! Meant to be enjoyed with your BFFs! Call your BFFs – it’s time to fill your glass with friendship, fun, and flicks. 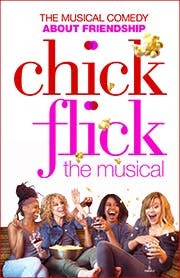 Chick Flick the Musical invites you to join Karen, Dawn, Sheila, and Meg as they get together to unwind, watch a chick flick, and play their favorite drinking game. As the festivities proceed and the tequila flows, can the power of meet cutes and makeover montages save the day as relationship drama and career crises bubble to the surface? Whether you’re a fan of romantic comedies or teary sisterhood dramas, you’ll recognize the delicious tidbits of life advice that chick flicks offer our four friends in this hilarious and heartfelt comedy about life’s greatest love story: friendship.